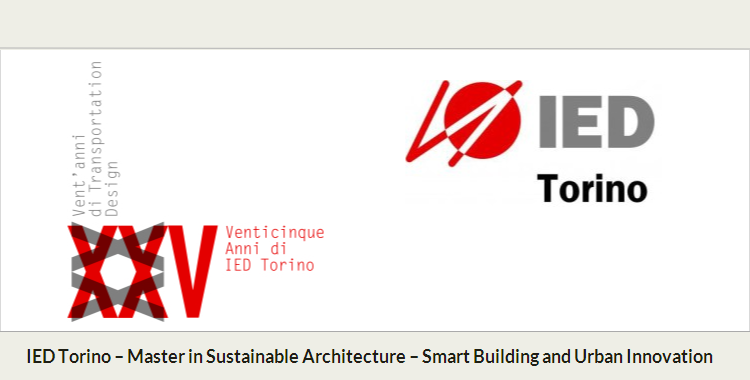 Co-de-iT joins the ‘IED Turin – Master in Sustainable Architecture‘ to develop a series of courses and other activities on the topic of Innovation, Environment and Urban Data driven Design along the entire Master Program. The collaboration is aimed to develop activities and organize specific classes to explore the tools and processes of innovative design technologies (such as parametric and computational design, data driven design, data mining). Students will learn to find, generate and manage environmental and urban data to be applied in a parametric design strategy in order to inform an aware design process. The results will represent a consistent body of work for an informed building design. The visual programming interface, Grasshopper, has extended Rhino into a powerful parametric design tool. It enables architects and designers the ability to translate design thinking into a parametric logic that maintains associative links between geometry. It is an extremely fast and intuitive way of creating flexible and parametric models. The workshop will be an introduction to parametric design. It aims to promote digital technologies to support the design and manufacture providing participants the fundamentals of parametric and generative modeling through Grasshopper. The workshop goal is to highlight, managing and develop the relation between information and the geometry implicit in the use of parametric tools. The modeling of parametric geometries (NURBS and Mesh) in fact requires the ability to set and manipulate data structures – information – in order to define the entire process of design that can go from design to production. Students will learn how to build and develop parametric data structures (from basic simple lists to complex data trees) to inform their data-driven geometry/envelopes, to create populations of responsive models and how to extract and use relevant informations from such models for construction processes. The workshop will introduce the students to parametric design techniques as a new medium for architectural design. The workshop aims to explore context-specific design and patterns based on a feedback loop and negotiations between the relevant forces and the participant’s aesthetic sensibility and to explore new design possibilities towards performance-oriented design. The workshop will teach at managing and develop the relation between information and geometry working on condition-specific envelope systems. Surface discretization (paneling), driving geometry through information (whether coming from environmental analysis or any kind of database), extracting and managing informations for construction processes all require an understanding of data structures in order to build seamless design-to-construction pipelines. Through visual scripting in Grasshopper (Generative modeling plug-in for Rhinoceros) participants will learn how to build and develop parametric data structures (from basic simple lists to complex data trees), data-driven responsive geometry and envelopes and how to extract relevant informations from such models for construction processes. Students will also develop a personal envelope project and its full design-to-construction pipeline. Data extraction from previous tessellation, visualization and storage in spreadsheets. Analysis of specific site environmental data to develop a data set and generate an architectural envelop with responsive features driven by the data-set conditions.